The scale and significance of the Terracotta Warriors’ discovery in 1974 has meant that it attracts a huge amount of attention when part of it goes on tour and it is expected that China’s First Emperor and the Terracotta Warriors at Liverpool’s World Museum will attract 450,000 visitors from its opening in February until it closes in October. However, by themselves the ten Terracotta Warriors and more than 180 artefacts from museums across Shaanxi Province in North West China would paint a very conventional display and it was decided in January 2017, as the storyline for the exhibition was being mapped out, that a more immersive approach would be taken. 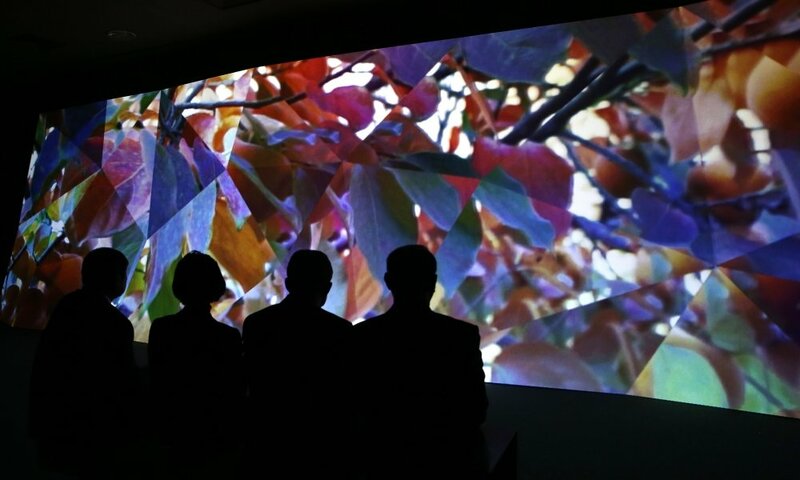 There are five large-scale AV elements to the exhibition, two of which include AR and they form the beginning and end of the story. 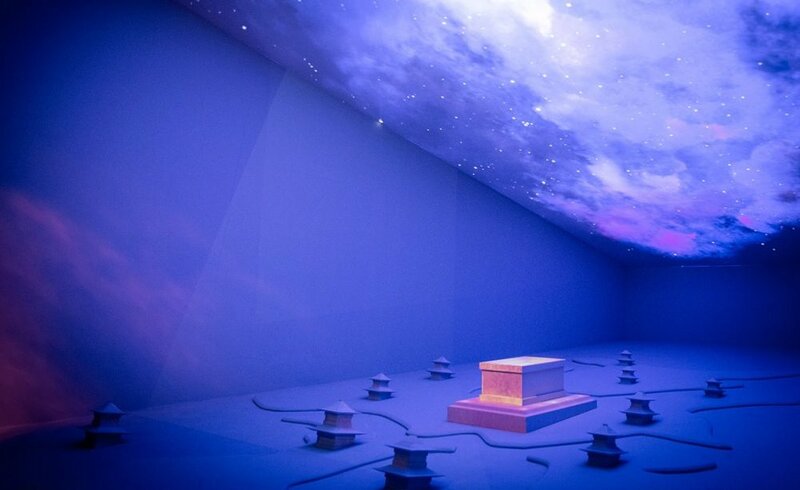 The exhibition opens up with a dramatic 13m geometric wall that mixes video, animation, graphics and AR to tell the history of China from modern day to ancient times when the First Emperor, Qin Shi Huang (259 BC – 210) unified warring factions to become China’s first emperor. 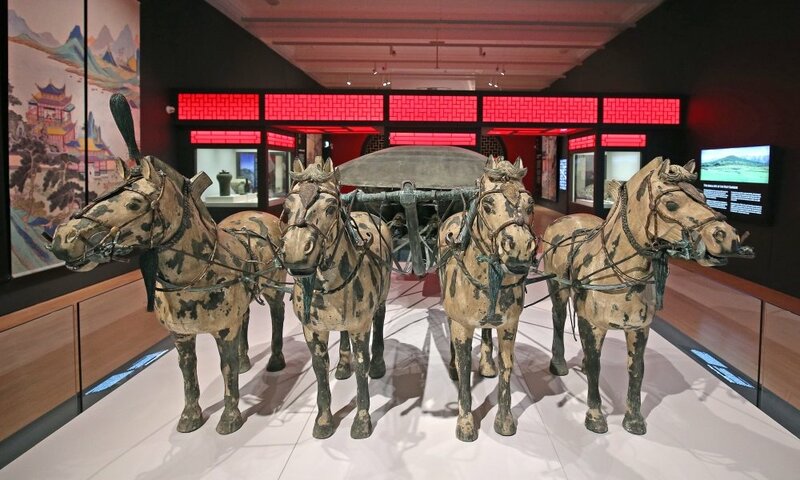 When the introductory display has finished the doors to the main gallery open automatically and the visitor is greeted by the spectacular view of the horse breeder and a cavalry horse from the first emperor’s burial site. Visitors are then introduced to the story through three AV displays showing images, video and illustrations all without sound so as not detract from the statues. Here there is an illustration based on Chinese ink drawings that have been transferred to computer and then animated. As visitors move to the stage where the Warriors are situated have a huge screen that contextualises the story. The penultimate AV display covers history spanning one thousand years through three distinct dynasties. This is achieved through images that connect to the burial such as shots of the excavations and shots of the figures in situ in burial pits. Philpott says the use of AV and VR is about engagement with visitors and the being relevant to the broadest possible audience. She says it was a way of enhancing the museum’s storytelling. 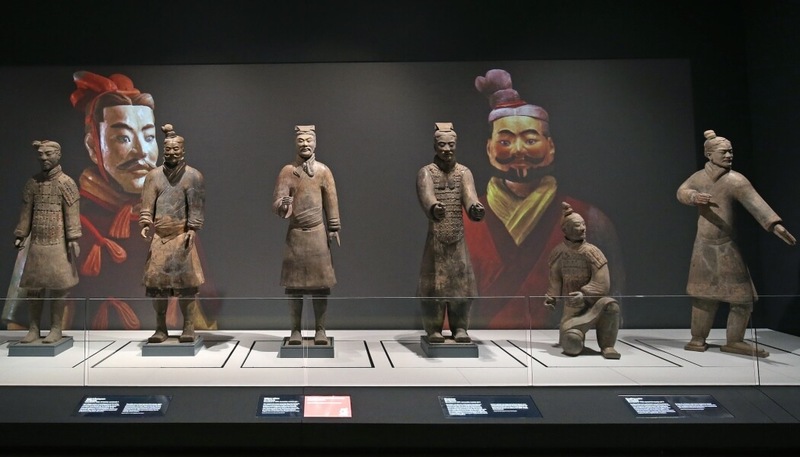 When visitors arrive at the exhibition they are initially transported to China to familiarise them with the sights and sounds of the modern day and them take then back across time to the Shanxi Province and Xi’an where the Terracotta Warriors were discovered. To help with the main gallery AV, the team created a virtual gallery so head of exhibitions and design, Fiona Philpott could stand in it. This enabled her to understand sight lines and see how the gallery projections would work above the cases. She was also able to kneel down on the floor and see what it would be like for children. “It was a fantastic planning tool”, she says. Originally the museum team planned to have a wholly immersive exhibition but the cost would have been too great, however, the final exhibition still pushed the boundaries of what’s gone before. 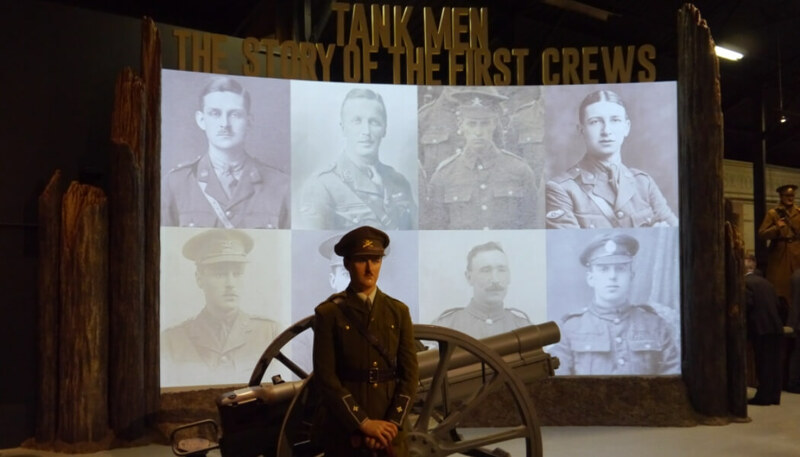 She says the team achieved a balance of AV and exhibits and throughout the exhibition journey the AV is interspersed evenly with the display of the artefacts. For the final AV element in the main gallery the team wanted to give a sense of the thousands of figures that were discovered in the First Emperor’s burial chamber. For this they used back projection to allow them to show wide angled shots of the pits the Warriors were found in, which gives the visitor a sense of the magnitude of the site, and also enabled them to hone in on the detail of the some of the figures. For the exhibition’s grand finale the team created a false perspectives of the burial chamber by building a set with wooden models and film projection. The presentation opens with smoke and music and as the smoke clears a gold and gleaming space is revealed, which has rivers of mercury flowing through the floor and hundreds of little palaces, Constellations adorn the sky above and as the visitor is soaking up the atmosphere a bird flies through the space and triggers a booby trap and arrow shoot at the visitors as if they in the midst of a great battle. Philpott says when it comes to historic material that derives from cultures that people are unfamiliar it is always important that museums provide contextual information to enhance the interpretation. She says that AV can set the scene and helps to explain objects in more detail. She says the scope for using new technologies in museums is massive, and National Museums Liverpool is really excited to have teamed up companies that make engaging exhibitions possible. She says the team looks forward to continuing the conversations and finding future opportunities to explore emerging technology and how it can be used to support the museums’ exhibitions.